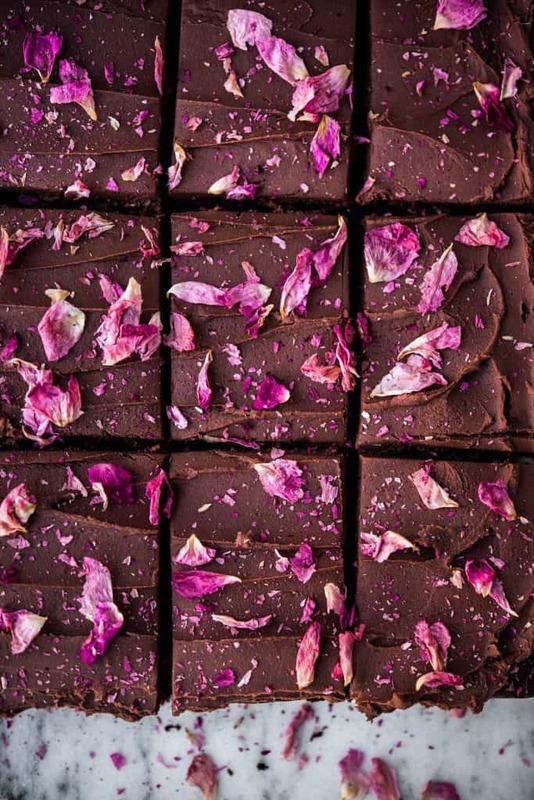 These decadent brownies are insanely fudgy. There’s never enough chocolate, so we added a luscious chocolate ganache frosting. If you’re like us, you might have a hard time stopping once you taste it. Did we mention that they’re completely gluten free and vegan? 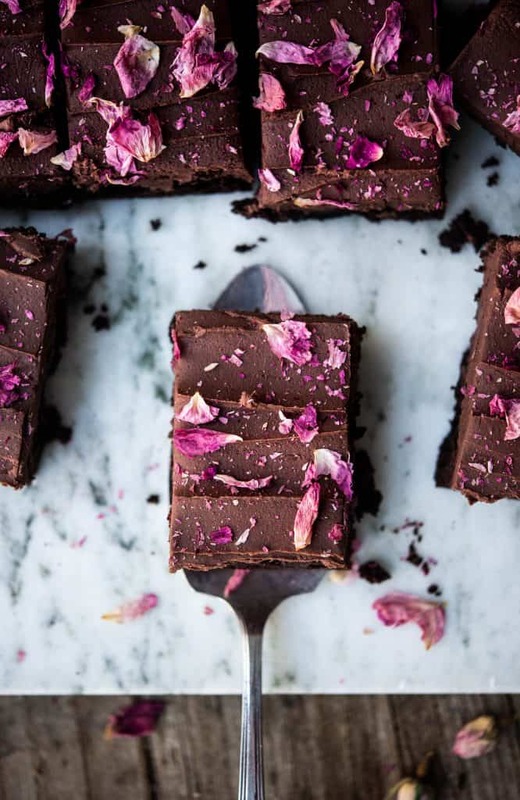 Valentine’s Day is less than two weeks away, so we added crushed rose petals in addition to the creamy chocolate ganache on top of these brownies. You can give your Valentine chocolate & flowers in one edible gift. Pretty innovative gift giving, if you ask us. 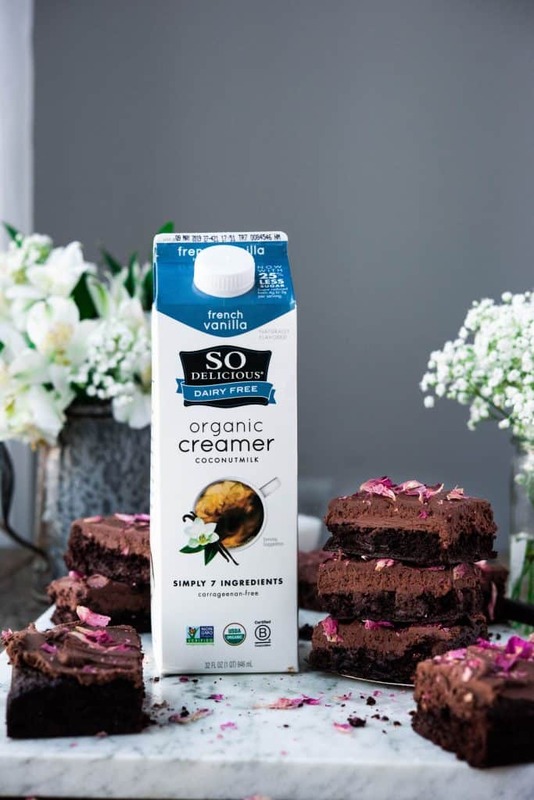 We’re thrilled to partner with Feedfeed and So Delicious Dairy Free to bring you this recipe featuring So Delicious Dairy Free French Vanilla Organic Coffee Creamer. It’s the secret ingredient in our chocolate ganache frosting. The vanilla flavor is perfect in the frosting, and it’s what makes the end product so creamy and luxurious. It’s also a great substitute for regular creamer if you want a healthier alternative. I love adding French Vanilla Organic Creamer to my coffee (I’m sipping some as I type this!). The creamer is very versatile, however, and can be used in place of regular cream in vegan dessert recipes. I’m looking forward to using it in some homemade ice cream this summer! 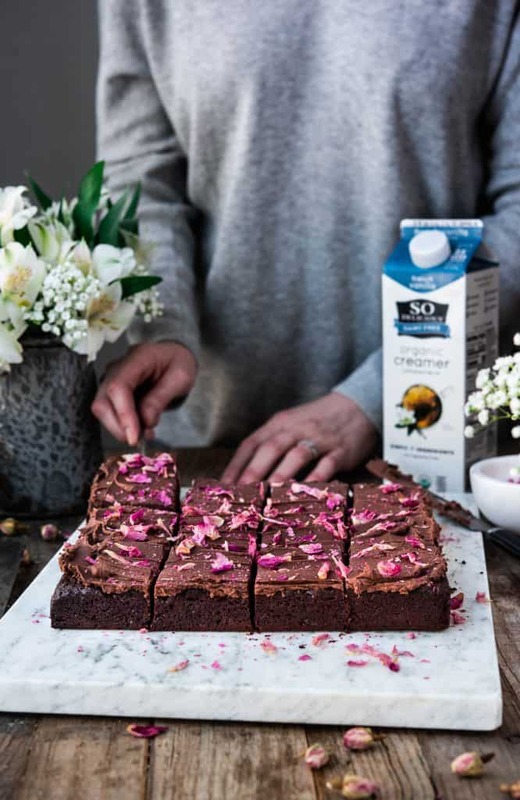 We love using So Delicious Dairy Free products for more than just taste. This creamer contains only seven ingredients (all organic!) and it’s completely free from carrageenan, which is a plus. I love their almond-based products as well. As far as creamers go, nothing beats the creaminess of their coconut milk products, though. Even if you’re not dairy free or vegan, So Delicious products are well worth a try. My dad is definitely not dairy free, but never uses dairy creamer because the alternative is so delicious (see what I did there?!). 1. You’ll have to heat up the cream before pouring it over the chocolate. To do so, bring to a very light simmer in a small saucepan, stirring frequently to avoid burning. You want it hot enough to melt the chocolate, but since it’s only a half cup of cream, it burns easily. You could also heat it in the microwave, but I like keeping an eye on it on the stovetop. 2. Be sure to soften the butter before adding it to the chocolate ganache! If you forget to take it out of the fridge a few hours before baking, you can use the microwave. To do so, cut the stick into tablespoon-sized pieces, remove wrapper and heat in 7 second intervals until softened. 3. Lastly, the instructions note that you must refrigerate the ganache frosting for 30 minutes before whipping it. 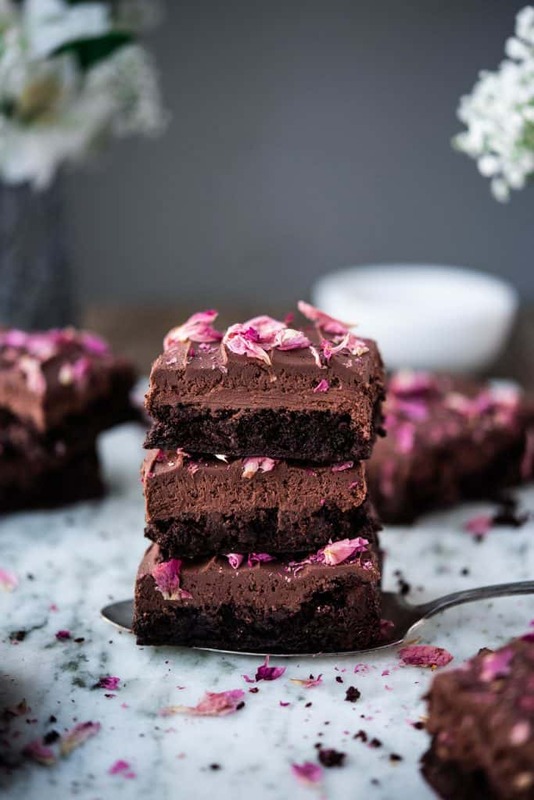 This is an important step – otherwise, the frosting won’t have time to set and you won’t get the right texture to top the brownies. It’s worth the 30 minute wait – once it sets, it whips up perfectly in about 30 seconds! If you follow all of these instructions, you’re guaranteed to have the best vegan frosting of your life – we promise! 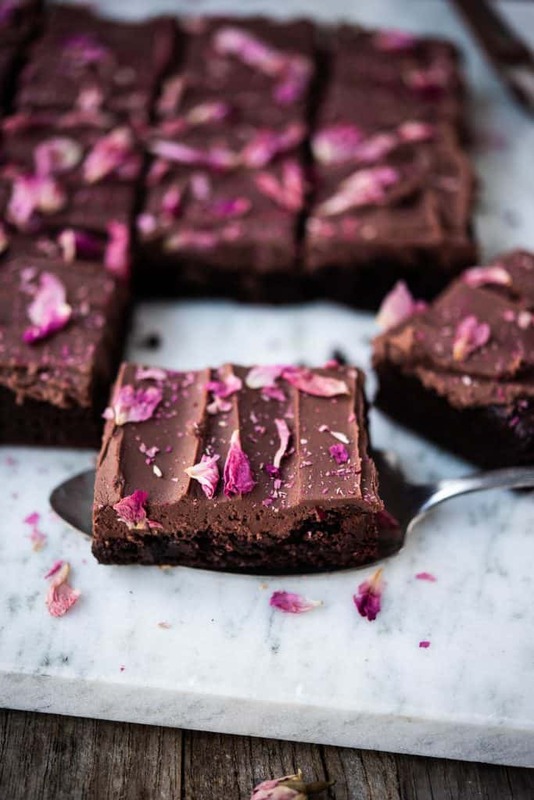 These rich, fudgy vegan and gluten free brownies are the perfect treat for your Valentine. Rose petals are optional, but encouraged! Preheat oven to 350 F and line an 8×8 inch pan with parchment paper. Make flax eggs by combining 2 tbsp flax meal with 5 tbsp room temp water. Stir and set aside to thicken for 20 minutes. In a small bowl, whisk together gluten free flour, baking powder and salt. Set aside. In a medium bowl, whisk together almond butter, coconut sugar, maple syrup, melted coconut oil and vanilla until smooth. Whisk in flax eggs and melted chocolate until well incorporated. Add cocoa powder in thirds and whisk until smooth. Use a spatula to fold in flour mixture (at this point, the batter will be too thick to whisk). Stir until well combined. Fold in chocolate chips. Pour into parchment paper lined pan and spread evenly. Bake for 32-35 minutes. Remove from oven and let cool completely before frosting (about an hour). Heat creamer in a small saucepan over medium-low heat until it just comes to a slight simmer. Keep a close eye on the pot so it doesn’t burn. Pour chocolate into a mixing bowl. When cream is very hot, pour over chopped chocolate. Don’t touch it for 1-2 minutes, until the chocolate starts to melt. After about 2 minutes, stir with a spatula to incorporate. Slice butter into 8 tbsp before adding to chocolate mixture. Note – the butter must be softened before you add it, otherwise you’ll end up with chunks of butter in the frosting. If you forget to soften the butter ahead of time, slice into 8 tbsp, place on a microwave-safe plate or bowl and heat in 7 second intervals until softened. After adding butter, let sit for a few minutes, the stir to combine. Using the whisk attachment on a stand mixer (or hand mixer), starting beating the mixture. Add salt and 1 1/2 cups powdered sugar, beat just to combine. Place bowl in refrigerator for 30 minutes. It needs time to cool/harden before you whip it into a frosting. After 30 minutes, remove from fridge and beat again. If it’s still too thin, add another tbsp of powdered sugar and continue beating for 30-45 seconds, or until frosting is lighter in color and fluffy. Do not frost brownies until they are completely cool, otherwise the frosting will melt. 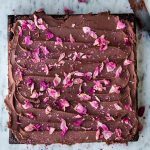 After frosting, sprinkle with crushed rose petals and enjoy! The butter must be softened before you add it to the frosting, otherwise you’ll end up with chunks of butter in the frosting. If you forget to soften the butter ahead of time, slice into 8 tbsp, place on a microwave-safe plate or bowl and heat in 7 second intervals until softened. 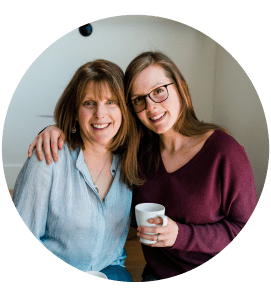 This post is sponsored by Feedfeed and So Delicious Dairy Free. All opinions are our own. Thank you for supporting the brands that support us! Hello, what can we substitute almond butter with as we cant have it? thank you! Hi Kandace! We recently tried this with peanut butter instead of almond and it worked well. If you also can’t have peanuts, sunflower seed butter should work too!